Rockside Camp is situated at the foot of a rocky Kopje, small rocky hill with views of the Taita Hills. It is a great family-owned base to explore both Tsavo East and West National Parks. Rock Side Camp offers you a choice of activities; start by climbing the Kopje, a walk in the bush, or for those who enjoy bird watching, there have been 84 species spotted in one single morning. After your chosen activities you can relax by the pool or at the bar, and in the evenings watch the most sensational sunset. Don't forget to order a Rockside Sunset cocktail. The camp offers personal and individual attention to the needs of guests. The Tozers live at the camp on a permanent basis, and over the years, they and their team have done their best in making Rock Side Camp a home in the bush. 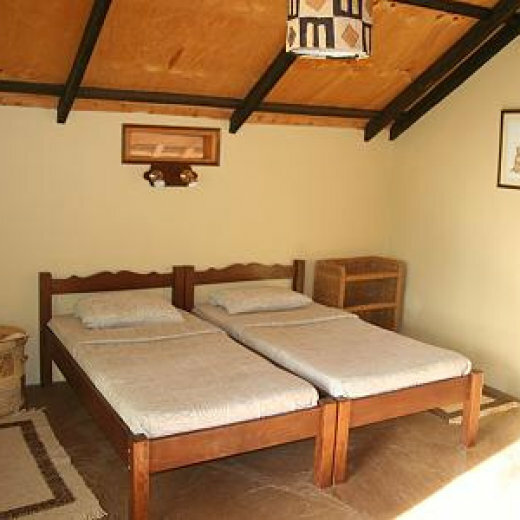 Rock Side Camp has 16 cosy wooden bandas and seven new luxury bungalows all with en suite facilities. All meals are served in the dining room, an attractive open building centering on a large rock that supports the large roof. The bar is well stocked with soft drinks beers, wines and spirits, its specialty being the rockside sunset cocktail.